Criminals are getting smarter. In the last year, new hacks that use social engineering tactics, authentic-looking "market surveys" on phones - and even gift items that arrive in the mail - are all intended to deceive and annoy. Worse, some new hacks use the computer as a surveillance system - to find out when you are not at home. Be wary of these 9 emerging exploits from hackers wanting to get at your home. Constellate: hackers are increasingly sending out documents such as a a jury summons, or gift cards that say you just need to visit a website and enter your credit card details. Is there a way to be sure a delivery driver is really there to pick up your packages? Matt Sarrel, a security expert with Allbusiness.com, says you must ask to see photo ID. He says hackers have also posed as cable and broadband installers who install a keylogger on your PC and then leave suddenly. Another new tactic is for hackers to send a free USB keydrive or CD in the mail or leave one laying around with authentic-looking corporate markings. Ryan Meyer, president at Meyer Technology Group, says the device uses autorun to install a virus, keylogger, spycam, or spyware software - even though the drive itself appears to be faulty. Another new tactic is to intercept voice phone calls, says Sarrel. Hackers build a homemade hacking device with parts purchased online that cost about $2,500. The hacker records what you say, then blackmail you or use the information for personal gain. Sarrel says another common tactic is for hackers to steal your email password, usually by guessing based on your birthday or a child's name, and then find out when you are not home to rob you, sd well as determine if there is any information they can use for blackmail, or other private data. This one is more common than you think, Many garage door openers do not use any encryption on the wireless signal, which means hackers can use the same make and model to program it to open your garage. 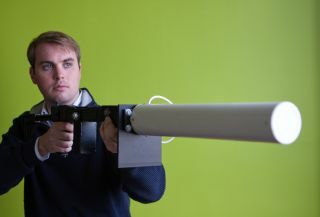 A few years ago, John Hering, the CEO at Lookout, demonstrated a Bluetooth sniper rifle that can be used to tap into smartphones in a home, even from a few streets away. According to Hering, these remote devices are becoming more common as a hacking tool since the criminal stays a distance away, but they are easy to build and can penetrate through walls and windows. Hackers are now also using a new tactic related to Facebook. Posing as a job hunter or someone doing a survey, they contact you through chat or email and ask you a few innocuous questions. At the very end, they ask a killer question, such as getting hold of your National Insurance/social security number. As reported by CNET earlier this year, the LANRev program is a common tool hackers use to record remote streams from a webcam. The truly heinous aspect: criminals are able to find out when you are normally not home and rob you.